The Country Bed Shop sells original antique beds and makes reproductions of antique beds as well as other furniture we are occasionally asked to provide information on how to rope an early bed. Note that beds with pegs in the top of the rail were not meant to be roped. They used a "sacking bottom" which is made of sail cloth (canvas) with eyelets along the edge and linen cording running between the eyelet and the peg. Rope beds always have holes through the rail. To tighten the rope start at point "A". Put the straining wrench (see below) through the rope like a clothes pin and use the handle to twist the wrench. While holding the rope taut with the wrench, jam your awl into the hole to hold the tension while you go to the head of the bed and tighten the next length of rope "B" in the same manner. Repeat this in the same order in which you wove the rope until you reach the end "D". At this point, wrap the rope around the wrench to secure it and tighten as before except this time jam the awl from the inside of the rail. Tie a secure slip knot as close to the outside of the rail as possible. Trim off any excess rope. Here is an example of one of my reproduction beds with a rope spring. Manila rope began to substitute for hemp rope about 1820. It is made from fibers of the abaca plant, a relative of the banana. Manila rope is either natural or oiled. Oiled rope is for outdoor use and should not be used on beds as it will stain the bedding. The rope is not necessarily labeled. Oiled rope feels and smells oily and may be labeled "Not for Use with Animals". Natural rope feels dry and smells, if at all, like dry hay. 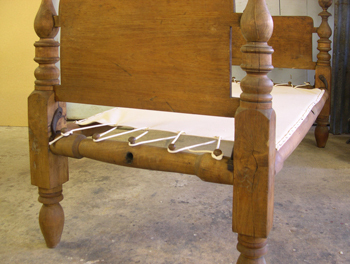 Beds with pegs in the rails or a simple rebate with evidence of tacks were design for a sacking bottom. The sacking bottom was a rectangle of sail cloth with eyelets to correspond to the pegs in the rail. It provided a smooth surface for the bed tick or mattress. We have an uphosterer make up sacking bottoms on request. Each is made to fit the individual bed. See the bed below which is corded on the end rails and tacked on the side. See Living History below for evidence that these beds were sometimes roped rather than "sheeted". Mattresses are better for persons of every age, than soft feather beds. They may be made of horse hair or moss; but hair is the best. If the mattress does not appear to be warm enough for the very young infant, a blanket may be spread over it. Dr. Dewees says that in case mattresses cannot be had, "the sacking bottom" may be substituted, or "even the floor;" at least in warm weather: "for almost anything," he adds, "is preferable to feathers." My wife and I have slept on it for 40 years with a thick bed board and a custom innerspring mattress that covers the side rails with cutouts for the corner posts - the only original.portion. As to rope, I have tried hemp, manila, nylon and cotton. Nylon is impossible because it never stops stretching. I found cotton to be the best and cheapest. But only after an old Chesapeake Bay waterman told me his trick about how to take the "stretch"and "shrink" out of any rope. He would let it out behind a boat and it would not only "unwind" but when it dried it would have "shrunk". I have never had a cotton rope get any slack since. A friend who didn't have access to a boat on open water told me he accomplished the same result by hanging cotton rope from a high rise building in the rain with a weight on the end. Finally, in my family we start roping side-to-side at the foot of the bed so that the change from side-to-side to end-to-end occurs at the head, where it is less conspicuous. And we don't loop the rope under the rails at the corner change; but instead wrap the rope around a dowel in the groove on the side, put it back through the hole and do the same in the groove on the head rail. Friction holds it in place. A lot of nostalgia from my past went through my mind as I wrote this. Few people today have any clue when they see holes and sawed off pegs in the rails of old beds, The term "rope bed" means nothing to but a few of us.